So you think you know Edvard Munch? Think again. That’s the tag-line for the Tate Modern‘s new Munch exhibition, whose premise is that Munch is an under-analysed artist, pigeonholed as a troubled loner and worthy of reassessment. They profess that there were more sides to his personality than just ‘the man who painted The Scream’, and the exhibition seeks to find out what else made him tick through an analysis of the other themes in his work, such as his debilitating eye disease, the theatre and his burgeoning interest in film photography. They implore us to see past the “angst-ridden and brooding Nordic artist who painted scenes of isolation and trauma”, but do people really want to strip off the interesting layers to reveal the normal, everyday Eddie underneath? Within the art community, it is a dream come true to find another piece of the missing puzzle, to “discover” the man behind the artist and to know exactly what his motives and inspirations were for every piece or artistic period in his life. However, representing the “whole picture” detracts from what made the artist interesting or unique in the first place, or even what makes the paintings so breathtaking. It is scientifically proven* that the longer you spend with a partner, the less interesting they become; in this way, the more you know about the banal aspects of an artist’s life, the less legendary they are. Stick to what makes Munch alluring – a tortured, unloved soul who expresses himself through his harrowing, yet awe-inspiring paintings. Edvard Munch, The Scream, 1893. Tempera and crayon on cardboard, 91 x 73,5 cm. It is more than agreeable to believe that Munch painted his masterpieces in an oxymoronic frenzy of despair – catharsis for his traumatic youth. 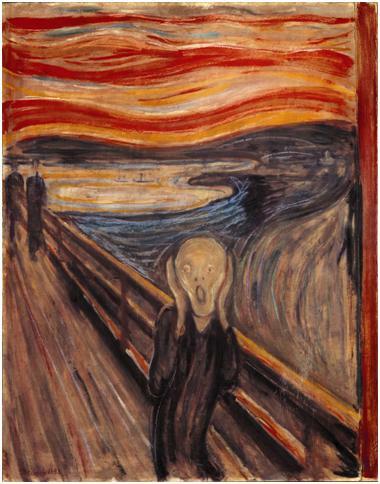 But this new wave of “understanding” of every aspect of Munch’s life has led to an interpretation that Munch was well aware of the techniques and visual effects that he employed to such devastating effect, and that it was in fact the commercial viability of reproducing a popular painting that drove Munch to rework his favoured themes time and again. If this is the case, then Munch knew how to play us like a fiddle. Edvard Munch: The Modern Eye is showing at the Tate Modern from 28 June – 14 October 2012. Or, to view some of Munch’s popular works (including The Scream), why not try this Munch art e-book? *it is not really scientifically proven.